Paint is actively peeling off the front bumper of my car and I have no clue why or what to do about it. It’s a Pontiac Vibe and I only see old cars on the roads with the same problem. Do you have any ideas, listeners? I appreciate the help! 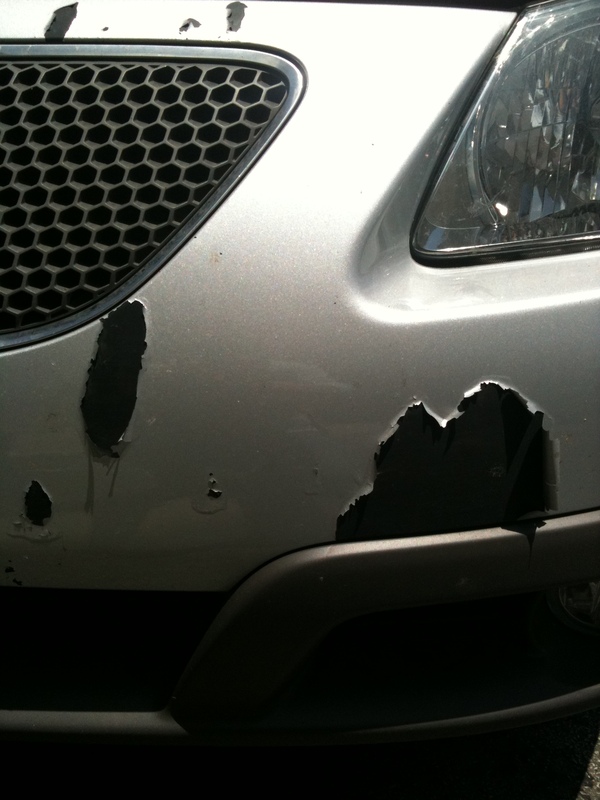 This entry was posted in Blog and tagged Help, Paul, Pontiac Vibe by admin. Bookmark the permalink. I bet the paint on your bumper is falling prey to the Texas heat 🙁 Maybe it is time for a new paint job? Just on the bumper? That’s no good. It’s not even the peak of summer yet. Okay, here’s what my husband the car freak said: bumpers are made of plastic, for the most part the body is made of steel. Plastic bends a great deal more than steel, and because the paint is hard, it doesn’t tolerate bending well. (so it flakes off) That said, it could simply be a poor prep job. That’s all I got, dude. Hope it helps. That sounds like a great explanation. Thanks! What do you think about something like a bumper cover? Too klassy? I like the bumper cover.